Get Immersed in the Experience — make your entertainment and educational venues accessible and immersive to individuals that are visually and/or hearing impaired. For a truly immersive experience, content can be triggered automatically as your customer enters an exhibit or show area, with no need of pressing additional buttons or punching in number codes. And more importantly, the content can be synchronized with the audio and video content in the venue for a true real-time experience. The Durateq ATV (Assistive Technology Version) is the most technically advanced solution for facilities such as theme parks and museums delivering technology used by individuals with disabilities. This includes Audio Description, Assistive Listening and Closed Captioning. 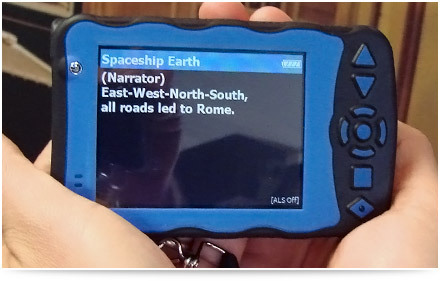 Based on our own rugged Durateq 3100 handheld, the Durateq ATV is combined with Captioning Studio and ALICE (Assistive LIstening and Captioning Engine) software making it ideal for deployment in facilities desiring greater accessibility to exhibits and attractions content. The Durateq ATV can also support multi-cultural accessibility with an unlimited number of languages. Here are some of the main features of the DURATEQ ATV. For a complete list, please download the DURATEQ ATV Datasheet. These features make the DURATEQ ATV perfect for industry applications such as museums, theme parks, education, etc. For more information on the independent testing performed, see the Durateq Military Standard 810F Whitepaper. For more information, see the DURATEQ ATV datasheet, or read about our complete Assistive Technology solution. DURATEQ® is a registered trademark of Softeq Development Corp.